Do you need a miracle? They still happen, says Wuellner, a wise spiritual director, counselor and healer. She's a witness to their power and mystery. "Fifty years ago, as a young pastor, I probably would've denied it," she writes. "But over the years I have become humbler, listening and observing more. Yes, acts of wonder still occur surprisingly often in the physical world. àGod works closely in, with and through us as every atom, each cell, every thought and action open to reveal God's love." Televangelists have sullied them, but the mystery of miracles fit into the biblical and theological framework of today. Rediscover their wonder and power. What does this story tell me about God and how God feels for me? How can this story help me with my problem? Wuellner explores the many ways God's generous goodness and mercy are available to each of us. 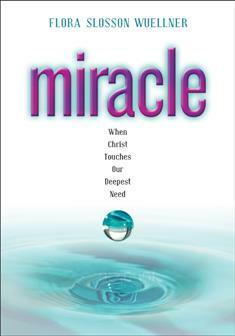 For anyone facing illness or a life crisis, Miracle opens the depths of spiritual richness for living a full life in spite of it all. Each chapter ends with a guided meditation. In these stories and meditations, you'll discover Christ's power to touch your intense hurts. Christ can transform them into a life of miracles.